Sam Jones, sculptress and reluctant sleuth, can't resist the opportunity to do Manhattan when she's invited to New York for a group show at a gallery featuring young British artists. With frightening ease she finds her feet and a series of barstools in East Village dives. New York, as loud and brash as Sam herself, welcomes her with open arms and plenty of excellent food, not to mention Sam's favourite margaritas...Despite her promises to stay out of trouble however, almost as soon as she arrives one of the gallery employees is found strangled in Strawberry Fields and the gallery itself has been trashed with graffiti - more red paint and swearwords than a New York subway train. Meanwhile the rest of the young British artists are turning up in New York, including the one Sam drunkenly fumbled in a club toilet not so long ago. The New Yorkers are popping Prozac, the Brits are drinking like fish and the body count is rising. Will the exhibition be a success? Will Sam's current boyfriend find out about her moment of abandon with a professional rival? Who will be the next person to be garrotted? 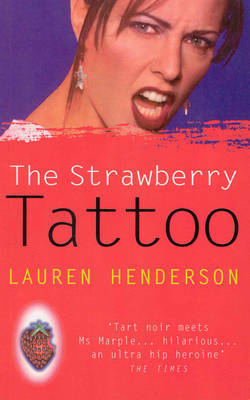 And will the whereabouts of the strawberry tattoo be the clue that finally solves the whole mystery?